Phyllis Curott’s first book, Book of Shadows, was an inspirational, spiritual memoir that chronicled her journey from Ivy League-educated, New York City attorney to Wiccan High Priestess. By inviting readers of all faiths to share in her own personal transformation, Phyllis debunked many of the myths surrounding Wicca and revealed it for what it really is: a spiritual movement whose tenets of Goddess worship and reverence for Nature were a great deal more accessible and familiar than she’d ever expected. In Witch Crafting, Phyllis digs deep into the practices and principles of Witchcraft to provide a comprehensive guidebook that anyone "novices and seasoned practitioners alike" can use to incorporate the beauty and power of Wicca into their own daily lives. Rich with detailed advice for making magic, working with Nature, and finding the Divine within, as well as thought-provoking evaluations of this remarkable spirituality, Witch Crafting is the special volume that you’ve been searching for. 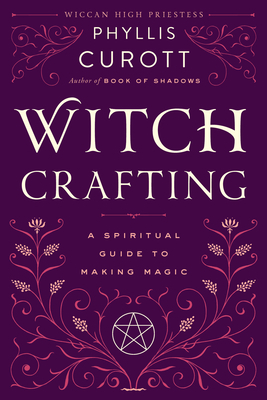 Whether you are a beginner or have been practicing Witchcraft for years, whether you worship in a coven or on your own, Witch Crafting is the ideal handbook for you, or anyone seeking to unlock the divine power that makes real magic happen and experience the ecstasy, energy, and gifts of the Universe more fully. Wiccan High Priestess Phyllis Curott is an attorney and the author of Book of Shadows. She was named one of the Ten Gutsiest Women of the Year by Jane magazine in 1999 and was a finalist for the Walter Cronkite Faith and Freedom Award in 2000. A Priestess for more than twenty years and founder of the Temple of Ara, she has been widely profiled in the media, lectures frequently around the globe and is widely respected for her work promoting civil rights and religious freedom. She lives in New York City and on the East End of Long Island. "Witch Crafting is a clever, down-to-earth guide to making magick a reality in the 9-5 world. In witty, wise, and warm fashion, Currot has witchcrafted a treasure trove of foundational information that will be cherished by readers for many years." "In her latest book Phyllis Curott takes your hand and leads you into the realms of magick where anything is possible. Passion and beauty resonate in this exciting, extremely relevant and important work."